In Hinduism, Mother Durga represents the embodiment of shakti, the divine feminine force that governs all cosmic creation, existence and change. It is held that Durga emerged from the collective energies of all of the gods, including Shiva, Vishnu and Brahma, to vanquish the demon Mahishasura who could not be defeated by any god or man. She is thus the compassionate savior of all of the gods and the universe. Durga exists in a complete state of self-sufficiency and independence from the universe and everyone and everything in it (in Sanskrit, Durga means "the impenetrable" or "the inaccessible"). At the same time, she is also regarded as the mother of Ganesha and Kartikeya, and is thus seen as the demon-fighting form of Shiva's wife, Parvati. Durga is honored with extreme fervor during the annual Navratri festival, which marks the beginning of autumn and occurs typically in September or October. Navratri means "nine nights" in Sanskrit, and on each day of the festival, nine different forms of shakti or Mother Durga are worshipped. In West Bengal, this festival occurs primarily on days six through ten of Navratri. On the tenth day, Durga's victory over evil is celebrated as Vijayadashami in Bengal and Dussehra in Hindi (in North India, Dussehra also commemorates Rama's vistory over the demon Ravana as described in the Ramayana). Durga Puja also celebrates the annual visit of Durga and her children to her ancestral home, and her reunion with Shiva on Vijayadashami. Our innovative trip focuses on the last six days of Navratri in West Bengal, which is known as Durga Puja or Durgotsava and is the largest festival of the year for Bengali Hindus. In the months leading up to Durga Puja, highly decorated, life-sized idols of Durga that depict her slaying Mahishasura are created by potters out of clay. In large open spaces around West Bengal, elaborate pandals, or temporary temples made of bamboo and cloth, are created to house the idols. 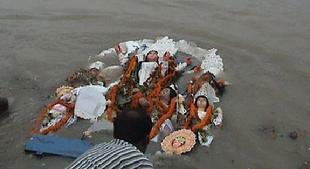 The idols are worshipped for five days and then carried in magnificent procession to a local river for immersion, symbolizing Durga's reunion with Shiva. The five-day period of worship is a time of personal introspection and bodily purification for devotees, with many avoiding meat, alcohol, onions, wheat and grains. The end of Navratri and Durga Puja further marks an auspicious time for starting new activities or business ventures. While references to Durga Puja in Bengal can be found as far back as the middle ages, it did not become popular among the zamindars, or wealthy landowners of Bengal, until the 17th and 18th centuries. In 1757, an elaborate puja was even held in honor of Robert Clive by Raja Nabakrishna Deb of Calcutta. Lord Clive wished to pay thanks for his victory in the Battle of Plassey, which established East India Company rule in Bengal, but the only church in Calcutta had been destroyed in battle, thus a puja was held at Deb's home instead. This was followed by subsequent pujas by other prominant Bengali families in which British Officers of the East India Company were the guests of honor. Each family would try to outdo the others with increasingly elaborate food and drink, decoration and music and dance entertainment. Soon thereafter, community or Baroyari ("twelve friends") pujas began to be organized by small groups of people excluded from the elite family pujas due to social status. By the early 20th century, these festivities had evolved into Sarbojanin ("involving all") pujas, in which people from all castes, creeds and religions could participate; these pujas further served to create a feeling of unity during the struggle for independence. These pujas were organized by neighborhood committees, who traditionally went door-to-door seeking funds for icon and pandal construction and ceremonial activities, with some portion of the funds donated to charity. Over the years, both the icons and the pandals have gotten more and more elaborate, and each year fierce competitions are held among neighborhoods for the best pandals and puja themes (past themes have run the gamut from the ancient Egyptians to Harry Potter). Today, the larger community pujas in Kolkata even have corporate sponsorship, adding a commercial aspect to this highly spiritual celebration. 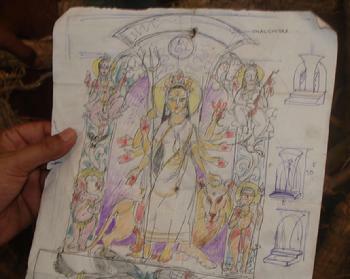 Over ten years ago, The Indians created the first behind-the-scenes tour of the Durga Puja Festival in West Bengal. This program contrasts the elaborate festival preparations and celebrations of the elite households and heritage neighborhoods of Kolkata with the more humble rituals of the rural villages of West Bengal. The first three days of our trip will include visiting Kumartuli, Area of the Potters, where the icons of Durga are sculpted and painted. Here we will learn about the rituals that surround the creation of the icons themselves, such as the gathering of the clay and the Chakshu Daan, or Offering of the Eyes. We will next join the crowds "pandal hopping" in the heritage neighborhoods of Kolkata, admiring the artistic displays and watching the fascinating puja choreography. We will also have the privilege of joining several elite families of Kolkata in their homes to observe their private pujas. The following three days will be spent exploring the Birbhum and Bankura districts of West Bengal. 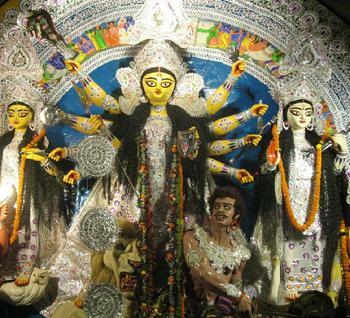 We will visit a number of traditional villages to view their puja pandals and festival processions. We will also learn about the rich textile and craft heritage of this area, which includes beautiful silk weaving, conch shell carving, dhokra metal casting and terracotta pottery. Our tour returns to Kolkata just in time to see thousands of Durga idols brought to the Hoogly River for ritual immersion on the last day of the festival. Immerse yourself in Bengali life and the Durga Puja festival by reading this entertaining essay by documentary filmmaker and travel writer Alexei Dmitriev.